MOSCOW — Russia's annexation of Crimea secured the future of its Black Sea Fleet, enabling Moscow to pump money into bolstering its capabilities while expanding its reach well into the Mediterranean Sea. Eighteen18 months ago, this hardly could have been possible. Under a highly restrictive basing arrangement with Kiev, the Russian Black Sea Fleet's size was limited, restricted, and the addition of new ships was prohibited. The fleet was destined to rot. "The Black Sea Fleet by 2010 had not been replenished with new warships for 25 years, and in fact [the fleet] had turned into a bunch of museum exhibits," said Mikhail Barabanov, a Russian naval expert at the Moscow-based Center for the Analysis of Strategies and Technologies (CAST). "Ukraine persistently tried to squeeze out the Russian forces from Sevastopol, or minimize their [presence]," he said. But in the wake of political upheaval in Kiev, and the perceived threat of a pro-Western government taking power there, Moscow seized an opportunity to ensure the survival of its fleet by annexing Crimea in March of last year. Two months later, Defense Minister Sergei Shoigu laid out his plans for the future of the fleet — 68 billion rubles (US $1.2 billion) would be allocated to add 30 new vessels to its ranks by 2020. Russia would restore its lost glory in the region, and move further in the Mediterranean. The reason for this activity is intimately tied to Russia's reasons for annexing the Crimean pPeninsula in the first place — the perception that NATO is aggressively encroaching on Moscow's interests in the Black Sea region. The threat of losing Sevastopol to an ostensibly pro-Western government factored heavily into Russia's decision-making. Not only were there fears of losing the base, but also fears NATO ships would eventually be stationed there. Such an outcome would have been unacceptable to Moscow military planners, as losing the base "would negatively affect Russia's ability to control maritime affairs in the Black Sea," said Dr. Dmitry Gorenburg, a Russian Navy expert at the CNA Corp.oration in Virginia. Though an alternate base was built near Novorossiisk, located on the Russian Black Sea coast, Crimea's central location was more advantageous and the port at Sevastopol — by virtue of its weather conditions — better suited for year-round the year operations, Gorenburg said. With Crimea firmly within its grasp, the Defense Ministry is focused on devoting significant attention to rejuvenating the fleet. 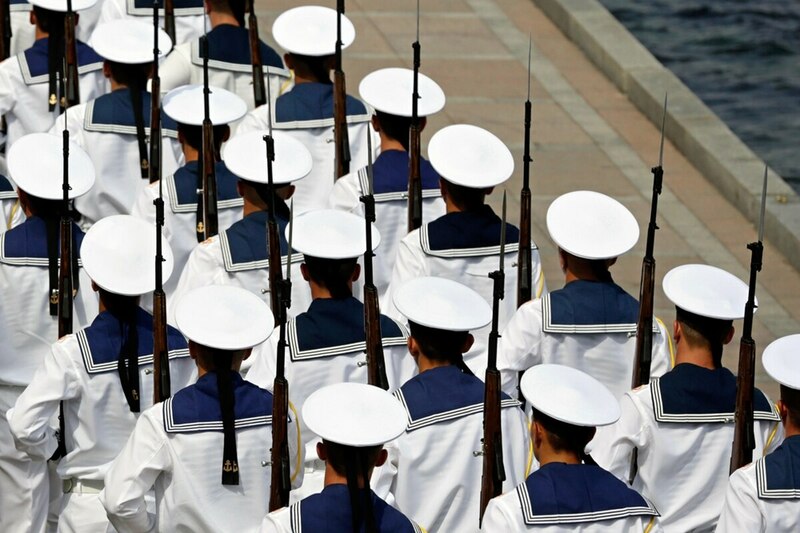 Not only is the Navy seen as a critical asset to deter perceived NATO encroachment in the Black Sea — Russian state media reports every NATO crossing of the Bosporus — but an instrument to quell future instability in the nearby Caucasus. In the next few years, the Black Sea Fleet will be joined by four brand-new improved Kilo-class diesel-electric submarines; two were delivered last year. By 2017, the surface fleet will be reinforced with six Talwary-class frigates, Barabanov said. By 2020, the fleet expects to receive six Bykov-class patrol ships and at least nine Project 21631 small guided missile corvettes. Overall, 30 ships are expected to be delivered to the Black Sea Fleet by 2020. These ships will not only patrol the Black Sea, but join take up duties in a re-established Mediterranean Squadron. Shoigu last week reiterated that the Black Sea Fleet will spearhead Russian interests on the far oceans. While the Black Sea might contribute to Russian national security more directly, by virtue of its proximity to actual possible conflict zones in Ukraine and the Caucasus, the Navy also hopes to use it to influence events in the Middle East and North Africa, Gorenburg said. "The Syrian civil war, Israeli-Palestinian conflict, countering Islamic movements in the region are all areas of strategic interest for Russia and they see naval power as a way to influence the situation in the region," he added. One prominent example of how the Black Sea Fleet was used to support Moscow's aims in the Middle East was the creation of the so-called "Syrian Express" — large tank landing ships running supplies between Sevastopol and Tartus in support of the regime of Bashar al-Assad, Barabanov said. As with many of Russia's military maneuvers in recent years, Gorenburg said the an element of prestige can't be ignored in factored out of Moscow's Mediterranean ambitions. Russia sees the squadron nominally as a means to counter US power-projection in the region, and the squadron can ease the sense of being surrounded by hostile forces, he said. "It also sends a signal to other countries in the region that Russia is back as an important power and promotes Russian arms for potential sales contracts in the region," with countries such as Egypt and Algeria," Gorenburg said.